As a distinguishing feature of termite colonies, the queen lays the eggs. She is the supreme mother. The colony started when the first queen and her king chose a place to shed their wings and set up housekeeping. Before that they were flying around in a big party called a swarm. When the swarm breaks up, a queen and king pair off and settle near a ready supply of the necessities of life, plenty of wood and sufficient water and some kind of shelter. At first, the queen may have only a small number of eggs. The first broods may be cared for by this queen and her king. It may be a matter of two or three years before the colony is fully organized. There is plenty of time because most queens live a long time, 20 or 30, or even as many as 50 years. After the first few batches of eggs, there will be enough workers to take care of the daily chores and the queen can concentrate on laying eggs. In most species this means many, many eggs. 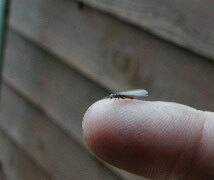 A queen will gradually grow to become much larger than when she was swarming with the other young females and males. To support a massive production of eggs, the queen must attain an abnormal abdominal size. While the workers and soldiers are tiny little things, the queen may be as big as a person’s thumb. The head, thorax, and legs of the queen may be no more than twice the size of a mature worker or soldier, but the abdomen is greatly enlarged to accommodate the production of the eggs. Some days these eggs will issue forth at a rate of one every few seconds. Never mind tending for so many offspring; the many workers will do that. When an egg issues from the queen during those later years of mass production, a worker will place it out of the way of the ongoing reproduction. Often there is an orderly array of eggs which are cared for by the workers as they hatch and then develop into tiny mobile workers themselves. In the meantime the queen just continues with her egg laying. 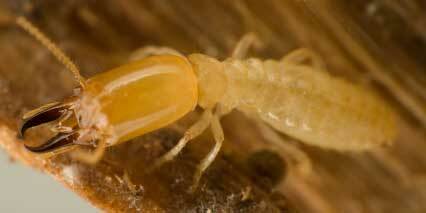 It appears that in many species of termites, numerous eggs have the potential of becoming queens. There may be hormones at the center of the nest that keep the ordinary workers from fully developing into egg-producing queens. However, if and when an old queen dies, there is often one or more fledgling queens waiting to take over the primary responsibilities of motherhood. Such in-colony queen development may skip the growing of wings and the attendant swarming with its nuptial flight and new colony establishment. There may even be more than one producing queen in a large colony. These other queens are called secondary reproductives. Sometimes each queen is compartmentalized from the others. These procedures and practices will vary from one species of termite to another. 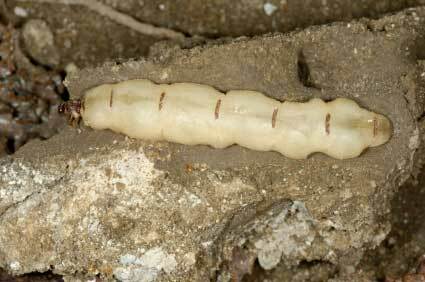 NextWhat Does a Termite Look Like?